Symbols are a wonderful way to quickly communicate quickly and help communicate with non-English speakers. 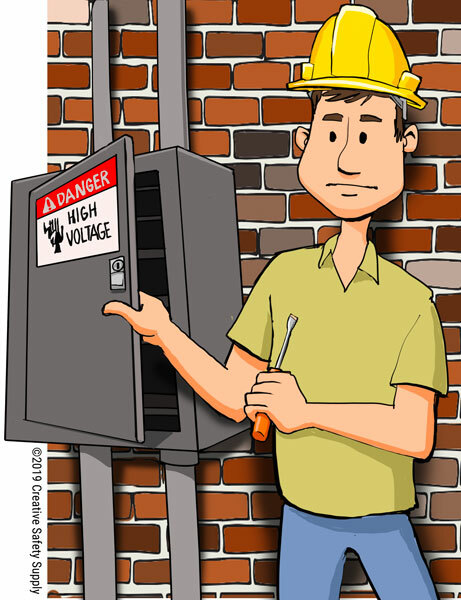 A safety alert symbol has been added as a key component to OSHA’s safety sign standard. This symbol, an exclamation point surrounded by a triangle, indicates a potential personal injury hazard, and should not be used for possible damage to equipment or machines. ANSI has developed standards regarding symbols, which can be found under ANSI Z535.3: American National Standard for Criteria for Safety Symbols. Hazard alert symbols convey information related to hazards. These symbols will either describe the hazard, how to avoid the hazard, and often times the consequences of not avoiding the hazard. and if there is a shape surrounding the symbol, it should be yellow triangle. Prohibition symbols are used for items or actions not allowed and feature a red circle with a red diagonal going behind or in front of the prohibited symbol. ANSI also refers to symbols featuring information to convey equipment location, fire equipment location, and mandatory actions. This symbol is commonly used for slipping and tripping hazards. Many different types of required PPE can be represented with a symbol including boots, gloves, eye protection, etc. This symbol is often used for crush risks or pinch points.